Attract wandering customers to your camp by handing them this custom imprinted boomerang cinch drawstring bag. The mesh drawstring bag is perfect for holding cell phones, custom water bottles, and other handy things. This cinch bag can be carried on shoulder or it also serves perfect for backpack carrying. The large compartment of this bag is secured with drawstring closure. Free shipping, free art setup and free online design proof can be availed on this drawstring bag. Request a quote to know bulk order discounts for this personalized boomerang cinch drawstring bag. Features –Large main compartment with cinch top closure or backpack carry. 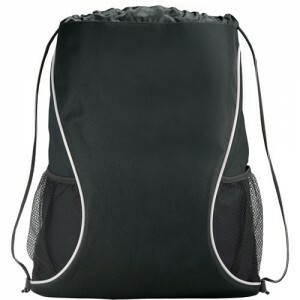 Drawstring design for over the-shoulder or backpack carry.Side mesh pockets.